My sister-in-law Jess did my hair the other night. 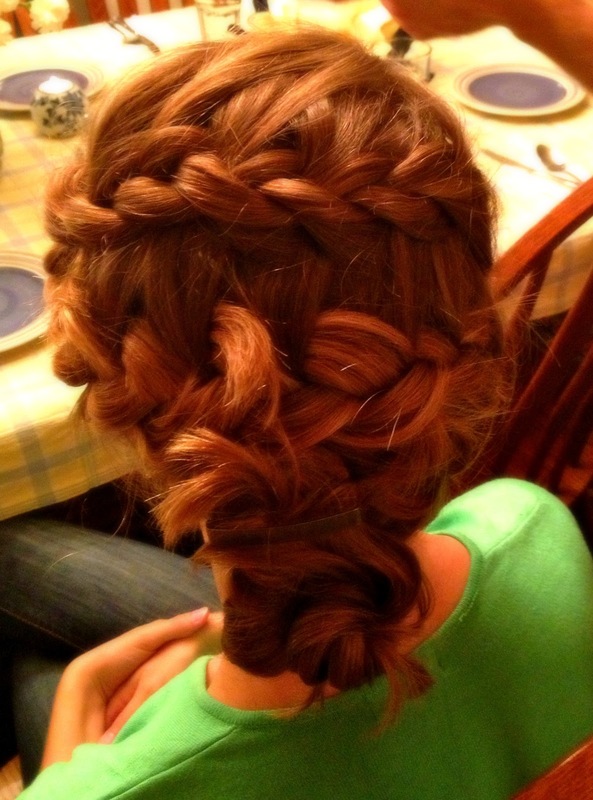 She did kind of a back-and-forth waterfall braid and then twisted up the end and clipped it with a small clip. I couldn't believe it when she showed me these pictures of the back of my head. It looks so complicated and romantic! What kind of face is that?! It looks like I'm judging the whole world, wrinkling up my nose at it! I didn't know Jess was taking this picture. Does that mean this my "default" face, the expression I go to when I'm relaxed and quiet? If so... yikes. I know I wasn't thinking judgmental and supercilious thoughts right then (or at least I try to un-think them when I do think them!) but it sure looks like I am mentally sneering at something. Have you ever looked at a candid shot of yourself and balked at your expression? Not sure what to do about this problem. Smile all the time?! Hahaha. Not laughing at your expense. I promise. I cringe at photos of myself on the regular. Apparently I would make a bad poker player! That braid is awesome! Candid shots of me are almost always terrible. I just look goofy, I guess. haha! Oh my goodness, this hair! I love it! My hair is way too short for it now but once it grows out again I'll definitely have to try and mimic this! And I don't think your face looks bad at all! I think you look serious, but not judgmental or anything! We are our own worst critics!